UNITED NATIONS (AP) — With rising unilateralism challenging its very existence, the United Nations convenes its annual meeting of world leaders Monday and will try once more to tackle problems together as a community of nations, addressing threats ranging from Mideast conflicts to the effects of global warming — and also encouraging the glimmer of hope over the nuclear standoff in North Korea. This year, 133 world leaders have signed up to attend the General Assembly session, a significant increase from last year’s 114. 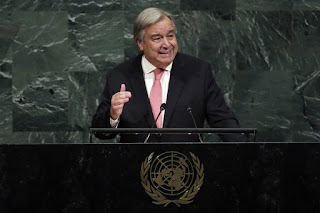 Secretary-General Antonio Guterres called the expected large turnout “eloquent proof of the confidence of the international community in the United Nations,” though other U.N. officials and diplomats said it’s in response to growing concerns about an increasingly turbulent world. The seven-year-old conflict in Syria and the three-year war in Yemen that has sparked the world’s worst humanitarian crisis and is now seriously threatening large-scale famine will certainly be in the spotlight, along with meetings on other Mideast and African hot spots. So will Iran, which faces escalating hostile rhetoric from the Trump administration over its activities supporting international terrorism, which Tehran vehemently denies. Guterres said last week that one of his overriding concerns in an increasingly globalized world is the threat to having the U.N.’s 193 member nations work together, which is the foundation of the United Nations. Whether it will be able to remains in question. At this year’s gathering of presidents, prime ministers, monarchs and minsters, populist leaders will include U.S. President Donald Trump, President Andrzej Duda of Poland and Premier Giuseppe Conte of Italy along with the foreign ministers of Hungary and Austria. U.S. Ambassador Nikki Haley told reporters that Trump, who champions an “America First” policy, wants to talk about “protecting U.S. sovereignty,” and she reiterated Washington’s opposition to the 2015 Paris climate agreement on curbing global warming and a newly agreed international compact aimed at regulating migration. “It all builds, because once you start down the path of intolerance, it’s very difficult to stop it, unless at the end of the day you have conflict,” he said. French President Emmanuel Macron is expected to be a key voice joining Guterres in the coming week in speaking out against this trend and supporting multilateralism as key to promoting peace. The week’s activities kick off with a peace summit Monday morning honoring the 100th birthday this year of South African anti-apartheid leader Nelson Mandela. A statue of Mandela will be unveiled at U.N. headquarters and leaders are expected to adopt a declaration recognizing the years 2019-2028 as the Nelson Mandela Decade of Peace. The increasingly strident U.S. rhetoric against Iran is expected to be a feature in U.S. speeches. Haley said that “every dangerous spot in the world — Iran seems to have its fingerprints in it,” which Tehran denies. Trump pulled the United States out of the 2015 Iran nuclear agreement in May and the foreign ministers of the five remaining powers who support the deal — Russia, China, Britain, France and Germany — are expected to meet privately Monday evening with Iranian Foreign Minister Mohammad Javad Zarif. The General Assembly’s “General Debate,” as the ministerial session is called, officially opens Tuesday with Guterres’ report on the state of the world, to be followed soon after by speeches from Trump, Macron and late in the morning by President Hassan Rouhani of Iran. The U.S. holds the rotating presidency of the U.N. Security Council in September and has scheduled two ministerial meetings, the first on Wednesday presided over by Trump. It was initially to focus on Iran but has now been broadened to the topic of “nonproliferation” of nuclear, chemical and biological weapons. “I’m sure that is going to be the most watched Security Council meeting ever,” Haley told reporters. U.S. Secretary of State Mike Pompeo will preside over the second meeting Thursday on North Korea, an issue the Security Council was united on in imposing increasingly tough sanctions. But that unity now appears to be at risk over enforcement of sanctions and the broader issues of how to achieve denuclearization of the Korean peninsula and when sanctions should be lifted against North Korea. Guterres welcomed the recent “positive meeting” in Pyongyang between the leaders of North and South Korea but warned that “there will not be success in intra-Korean negotiations if simultaneously there is not success in the American and North Korean” negotiations to rid the Korean Peninsula of nuclear weapons. U.N. spokesman Stephane Dujarric said the United Nations has received 342 requests for meetings during the high-level week. They includes sessions on conflicts in Syria, Libya, Yemen, Mali and Central African Republic as well as the plight of Rohingya Muslims in Myanmar, aid for Palestinians, education for girls, modern slavery, environmental threats, efforts to end poverty, and the 70th anniversary of the Universal Declaration on Human Rights. Uruguayan Ambassador Elbio Rosselli said the biggest issue for his country is multilateralism.